Saturday May 18th 1878 We got a very late start with the work and were at it most all day. I tried the new machine a little in the afternoon and like it splendid. It rained most of the day. I was [?only] sick all day. Went to bed early. Sunday May 19th 1878 It wasnt a very pleasant day and as I felt badly I did not go to church. I wrote and read a little in the afternoon. I had the blues about as bad in the evening as is possible for any one to have them. I went to bed early. 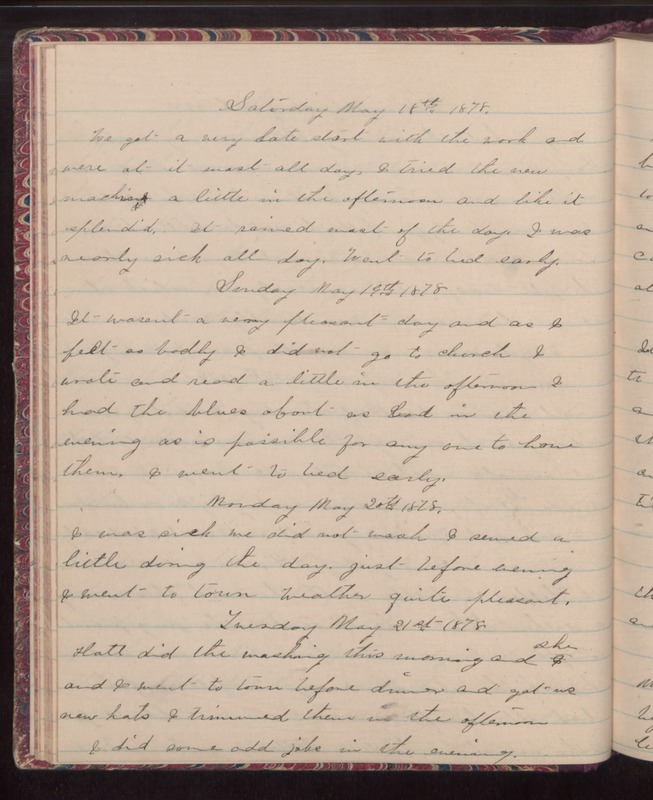 Monday May 20th 1878 I was sick we did not wash I sewed a little during the day. Just before evening I went to town. Weather quite pleasant. Tuesday May 21st 1878 Hatt did the washing this morning and she and I went to town before dinner and got us new hats. I trimmed them in the afternoon. I did some odd jobs in the evening.